Friday, 10/18/13, out of the blue, PortSide received an email from Don Horton looking for help acknowledging the work of women, children, and elderly handicapped seamen who he says served on tugs and barges along the coast under threat of attacks by German U-boats. Don Horton, a retired Director of Occupational Safety & Health for the Department of Defense, is seeking urgent support for two bills before the US Congress which would recognize the service of these mariners. Recognition honors recipients and gives them the status of US veteran with benefits limited to medals and burial benefits. The Senate is likely to vote on October 30th, and the House could vote at any time. He seeks letters of support to the congressmen on the Veterans Affairs Committees. Horton says the seamen, whose records were destroyed by government order, are another category seeking recognition. Able-bodied, adult, male seamen were recognized in 1988. The Senate is likely to vote on October 30th, and the House could vote at any time. The extraordinary story of these mariners also shines a light on the waterfront history of Red Hook, of Brooklyn and of the port of New York as a whole. Horton was one of those children who served on tugs and barges along the coast under threat of attacks by German U-boats. Don Horton is originally from Pennsylvania and now lives in North Carolina. 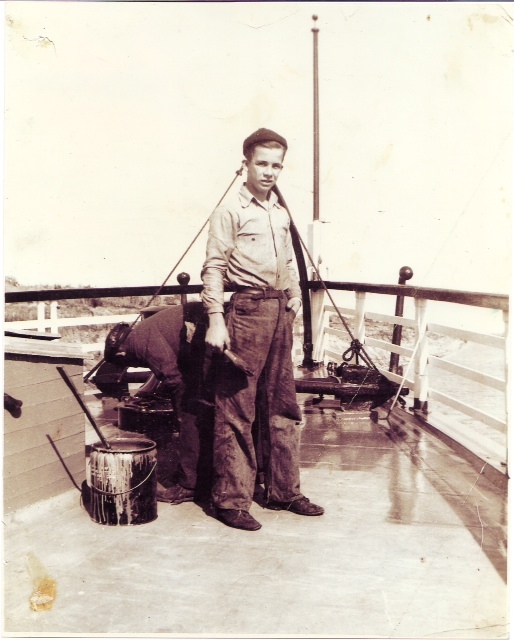 He began working on a coastwise barge as a ten-year-old alongside his family in 1942; and his mother was one of those women. Read Don Horton's vivid WWII memories of anchoring off Red Hook, Brooklyn and rowing into Erie Basin to shop on Van Brunt Street. Once again I am reaching out to my fellow seafarers in hopes of finding some who may be interested in helping us find those few remaining mariners from WW II. Many of those mariners were women, some were schoolchildren that stood up for this country and also helped to lay the foundation for women seafarers around the world. We now have a bill in both sides of congress. It has taken over 5 years and three sessions of congress and this may be our last chance to bring recognition to these few remaining mariners. The setup is rather complicated and far from me to truly understand. If you recall we started out with a stand alone bill HR 1288 but during the process it was incorporated into another one 2086 headed up by Tina Titus of NV. Within a week it was incorporated into still another HR 2189 that deals with problems within the VA. This bill is headed up by Jeff Miller of FL who also is the Chair of the House Vets Committee and has cleared the subcommittee and is at the floor level waiting hearings. S-1361 is heading for hearing in the Committee late this month. Both bills have few cosponsors and I have no idea if that is good or not. I had 94 cosponsors on HR 1288 and was incorporated into 2086 that had only 12 and then into 2189 with only 4. I have added 4 more to 2189 but have hit a snag. Seems that most of our leaders in congress may say they reach out across party lines but when it get down to doing it the lines grow silent. In any case we are farther along than ever before but need some help. As I recall in my email of last year I indicated we needed letters sent out to the various members of congress asking for their support either by cosponsoring these two bills or having the VSO write letters of support to the two committees saying the same. We need similar help and I am again reaching out to you for help in helping those that came before you. Will you help me? I have submitted some testimony to the Senate Committee on Veterans Affairs that provides some light on how I see picture and asked it be submitted for the record. They have acknowledged receipt and mention they will review. I have attached it to share with you in hopes you can find enough info to assist in sending some good ole letters or make some calls. Will you help us? The time is very short as the Senate meeting is scheduled for the last of this month. The House vote can be at any time. Please let me know if you can help. Thanking you in Advance. Good luck at your meeting also at the end of the Month. Peterson. BELOW: The tug “Margaret Sheridan”, of the D.T Sheridan Co., hauls a company tow eastward through Cap Cod Canal in the late 1940’s. The barges are empty with tow lines shortened up for the tow through the canal. The lead barge was undoubtedly at onetime a schooner barge and probably had three masts. Horton's older brother Billy was working on the tugboat Menominee when it was shelled and sunk nine miles off the coast of Virginia on 31 March, 1942 by German U-boat 754. RESULTS FROM US SENATE VETERANS AFFAIRS COMMITTEE HEARING ON 30 OCT. 2013 for S-1361 "WW II Merchant Mariners Service Act"
Disabled American Veterans: DAV does not have a resolution on this issue and takes no position on 1361. Note NC DAV approved a state resolution but National turned it down, essentially turning its back on WW I merchant mariners. Department of Veterans Affairs: VA defers to the Views of the DHS regarding Section 3 of this bill. Vietnam Veterans of America: VVA has favored such legislation conferring full veteran status on these individuals for almost thirty years, and now urges swift passage of this measure before all of them of dead and gone. Veteran of Foreign Wars: Did not make a statement on S-1361. NEXT STEP IS UNKNOWN. WILL ADVISE ALL WHEN APPRISED. Dear F/B fans. Yesterday we were successful in having the US House vote and pass HR 2189. This bill had an amendment within, HR 1288 “WW II Merchant Mariners Service Act. It received an overwhelming majority vote of 404 to 1 in favor and the bill is now on its way to the Senate. The next step is: tomorrow the US Senate will conduct Hearings on S 1361 “WW II Merchant Mariners Service Act”, an identical bill to HR 1288 that was amended into HR 2189. It is scheduled for 2 PM and can be viewed on C-span if anyone desires to watch. We have come a long way to correct a travesty ongoing for over 70 years. Many thanks to all the cosponsors of HR 1288 for staying the course and seeing this bill through the House and on to the Senate. I owe you a debt of gratitude. Let’s keep our fingers crossed to see this one also hit out of the park. Thanks for all your help.